Department of Aerospace Engineering Chair and Minta Martin Professor of Aerospace Engineering Norman Wereley is lead editor and a contributing author for a new book Magnetorheology: Advances and Applications published by the Royal Society of Chemistry as part of their series on smart materials. Magnetorheological fluids are a type of smart fluid that can change viscosity in the presence of a magnetic field. They are important for many engineering applications such as shock absorbers and dampers in aerospace. 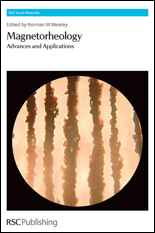 According to the publisher's description, Magnetorheology: Advances and Applications "provides an update on the key developments in the physics, chemistry and uses of magnetorheological fluids. Edited by a leading expert and with contributions from distinguished scientists in the field this timely book is suitable for chemists, physicists and engineers wanting to gain a comprehensive overview of these smart materials." Wereley holds a B.Eng. (Honors) in Mechanical Engineering from McGill University, Montreal, Canada, and M.S. and Ph.D. in Aeronautics and Astronautics from the Massachusetts Institute of Technology respectively. In 1993 he joined the Alfred Gessow Rotorcraft Center at the University of Maryland and currently serves there as the Director of the Smart Structures Laboratory and the Composites Research Laboratory. His research interests are in dynamics and control of smart structures, with emphasis on active and passive vibration isolation and shock mitigation applied primarily to rotorcraft as well as other aerospace and automotive systems.